Solomon Vitane Combi Pilot Skate with the Free-Allround iron is a sturdy ladies boot with an extra wide runner for natural ice is a great combination! Обычная цена: 24 691,56 руб. Special Price 22 906,18 руб. Performance Skating women's boot with enhanced lateral support. Control and comfort at a great price. Fresh design and women's specific fit. 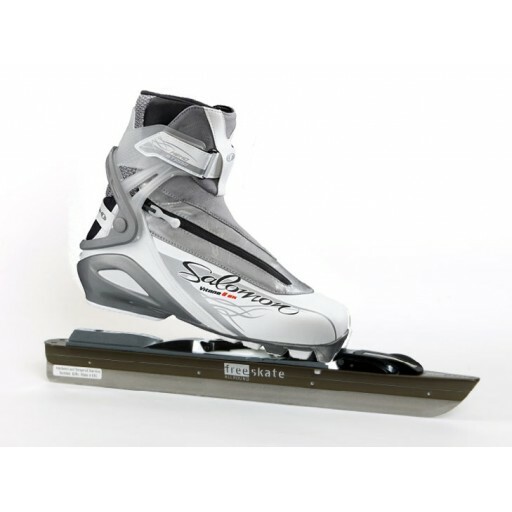 The Free-skate Allround blade including Salomon Pilot Equipe Skate bindings. The hardness of the Runner is a minimum of 60 Rockwell. The blades are available in four lengths. S (39.5 cm) M (42 cm) L (44.5 cm) and XL (47 cm).